This women’s tank top may raise some questions but it still is an amazing shirt. On this top you can see the planet earth from out of space and around it you find the text that says “Best Planet In The World”. Makes me wonder if earth is the world or if the whole galaxy is the world. What ever you think this top shows it and it looks neat. And we should be proud of our planet and take care of it like it’s the only place we can live at. This women’s tank top comes in black, grey and white and is made from 95% cotton and 5% spandex. 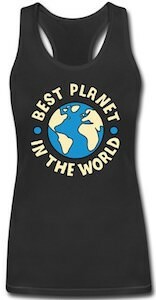 Now is the time to tell people about your world by wearing this Best Planet In The World Women’s Tank Top.